Mont Bleu, the home of superior quality crystal nail files and glass nail files. 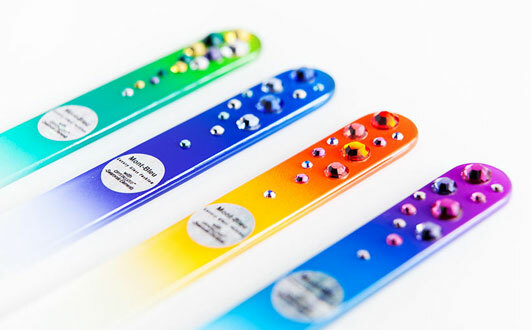 Czech made glass and crystal nail files with SWAROVSKI® crystals. 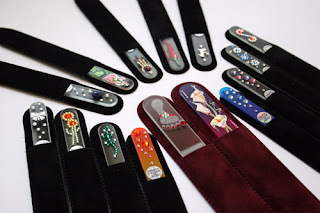 To request more information or to buy glass nail file, please visit the links. I was sent a great package with more than just glass nail files in it. Yes, you see earrings and tweezers too! The earrings are very pretty blue, almost the exact color of my birthstone, so that was a nice surprise. The tweezers are fab! As you can see they are more flat and wider, with an easier grip to use. It was a lot better than the ones I was using.... easier to get a hold of with that wider end. Both of the nail files are my favorites now too. I was one who used a metal nail file, and it did the job, but left some jagged edges sometimes. With a glass nail file, you don't get that jagged edge, but a smooth, clean finish. Now I was in a hurry one day, and didn't want to take the time to give myself a whole manicure. I decided to just buff out the chipped nail, with the plain color glass nail file, and I'm glad I did. I was able to buff it out, apply a new coat of polish, and go on about my time. With all that was going on, I found it extremely convenient. The best part is, my polish didn't ruin the glass nail file. You wouldn't even know I had it on while using it. So I think these are the best things since thong underwear! Really!!! Recommend? Definitely! Visit the website and get one or two! Disclaimer: I received some products for sample. I did not receive compensation for this post or my opinion.